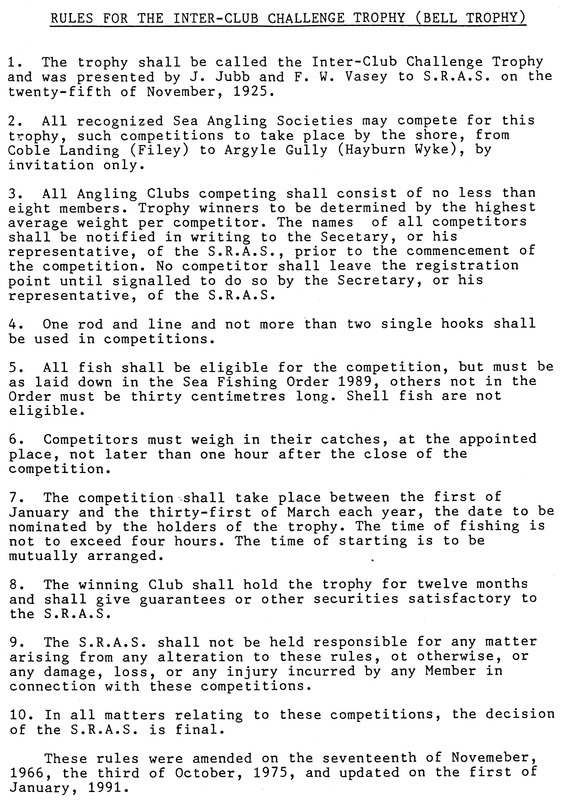 The Annual Inter - Club Tournament held in Scarborough, boundaries Hayburn Wyke Gully to Coble Landing, Filey. This was a 4 hr match, fishing from 10am to 2pm with the clubs competing for the Bell Trophy an which this years 87 anglers from 9 clubs participated. There was a strong westerly wind throughout the day and a fairly calm sea, this kept catches low although there was an improvement on last year, with 34 anglers weighing in 86 lb 06 oz from 60 assorted fish. The Bell Trophy was presented by Gordon Sharp, last years winners Dottrel club, to this years champions Cloughton who weighed in a total of 16 lb 15 oz, from 10 fish, an aggregate for 2 lb 01 oz. 1st - Cloughton - 16 lb 15 oz - 10 fish - agg 2 lb 01 oz. 2nd - Rock Anglers - 12 lb 13 oz - 8 fish - agg 1 lb 09 oz. 3rd - Whitby Sea Anglers - 22 lb 06 oz - 18 fish - agg 1 lb 07 oz. 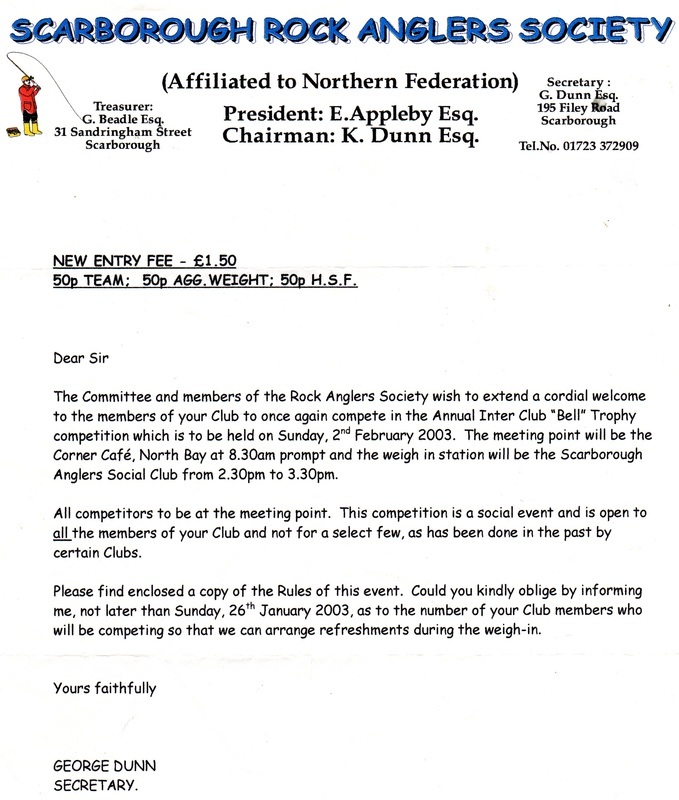 4th - Filey Boats - 9 lb 04 oz - 3 fish - agg 1 lb 00 oz. 5th - Filey Brigg - 8 lb 07 oz - 7 fish - agg 0 lb 13 oz. 6th - Southcliffe - 6 lb 05 oz - 3 fish - agg 0 lb 12 oz. 7th - Bridlington - 5 lb 05 oz - 5 fish - agg 0 lb 09 oz. 8th - Dottrel - 4 lb 11 oz - 6 fish - agg 0 lb 07 oz. 9th - Scalby Mills - no fish. The sweep for the heaviest fish was won by Richard Cappleman of Filey with a cod of 4 lb 01 oz. The heaviest bag of fish winner was Jeremy Robinson Cloughton Club with 8 lb 03 oz.